to colour. I adore blue and white as you know, but I have those wonderful putty and black vintage map cushions from Ikea and then there's the Chalkboard surf board I made and I don't think they go so well with the blue covered foam. The problem all started when I purchased the foam cushion for the cane lounge. It was funny, cause this burly guy walks into Clark rubber, as I was discussing with the shop assistant which type of foam to get. He kind of interrupted saying 'What's your best price, I'm a good customer Come on Come on? ', to the manager. I piped in saying "Well if he's getting a deal, I want one too' and so the poor guy kind of had to give me one as well. He lead me over to the rubber cushions which already had a blue cover. I was just thinking about getting bare rubber and covering it my self in calico. But the one he suggested already had a cover and hey I could work with that. I do love blue after all and it was kind of the colour of denim. So far so good!!!!! I brought it home and it looked great with my existing nautical stripe cushions, but not so good with the putty and black. The blue and white nautical stripe will not survive out here in the weather. The Beach House Brats put them through their paces inside in any case, but with sideways rain this area occasionally gets very wet. So I reckon the blue and white will not be staying, but for now I am very happy relaxing out here with my tea. I also hung this little extendible coat rack above the lounge, so we can hang our towels and beach stuff up. Correction....so I can walk around after the three other occupants of the Beach House picking up their towels and cozzies and I'll have somewhere else to hang them other than the balustrade. 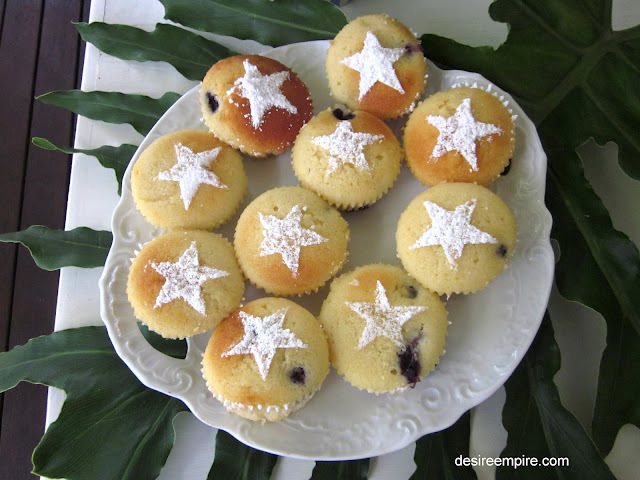 Oh and I made these little star stencilled cupcakes for the kiddos afternoon tea They woofed most of them down before I could get to them with the stencil, but the ones I decorated look rather cute. Also I am having a little anniversary today. I began blogging on 1 March last year and it's definitely been a fabulous experience. From where I'm sitting I can't imagine writing another years worth of posts. I mean there's only so many times you an make over your home right? Since November the ideas have been really flowing out of me more than ever and I am kind of wondering if that's because it's been Summer. I also rediscovered how much I love making things at Christmas time and that has continued into this year. I wonder what the future holds for me and this little old blog. I'll go with the flow and hope to be talking about my second anniversary a year from now. Who knows!!!! But you dear readers, are the real stars of this story. You have stuck with me and been so lovely in your praise and support. And to Emma, who recognised me as the author of this blog and stopped me at the lights last week, to let me know she loved it, through her car window........ thank you. You made my day!!! It's those lovely encounters that keep me going. Lets face it, Mr Beach House and the Beach House Brats completely take me for granted, so I'll keep coming back here as long as there are lovely people like Emma hanging around and encouraging me to keep it up!!!!! Blogger seems to be up to her tricks again. My new posts are not showing up in my GFC follower's dashboards, or on the blog rolls that my lovely readers have put me on. . I am writing this in Blogger so not sure why Google has cut me out of the loop. I am sure there are lots of non 'Blogger' bloggers going through this too, so I feel your pain. I usually post on a Monday, Wednesday and Friday morning Sydney time, so be sure to check back if you don't want to miss something. I also update my facebook, twitter and linky followers so they are other ways you can see if I've posted. Hopefully Google fixes this soon as it sure is frustrating. 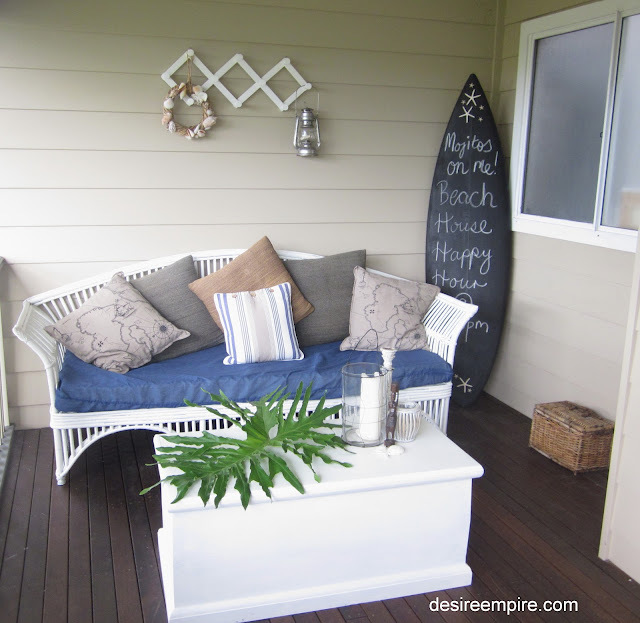 Your Summer deck is fabulous, Carolyn! Thank you for sharing at Potpourri Friday! I agree about the "how many times can you etc. etc." but that's why I like to do tablescapes. You can change them as much as you want (you just need a lot of storage space!). I love the blue and white look. 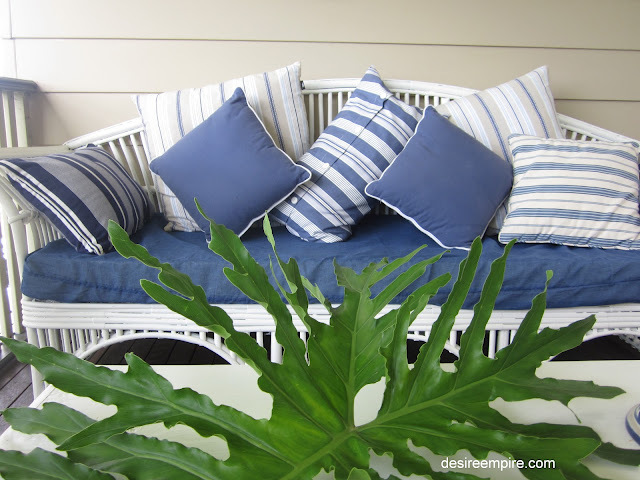 Get yourself some outdoor fabric pillows for the rainy season and then just switch them out. I have outdoor pillows on my adirondack chairs that sit out in all the Florida weather (rain and sun) and they still look great even with a black background! Happy Blogoversary! Your porch looks great. Wish I had an ocean view! 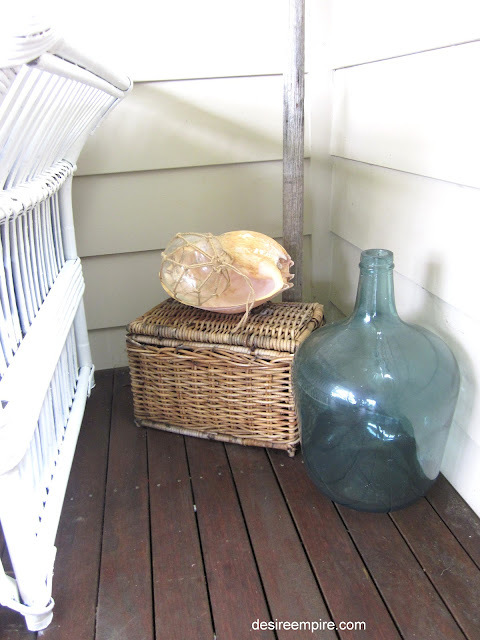 Love the glass wine bottle, too! it looks very inviting! i'd love a lantern like yours. Happy Blogiversary, Carolyn! Amazing how quickly that blog year flew by, huh? lol! 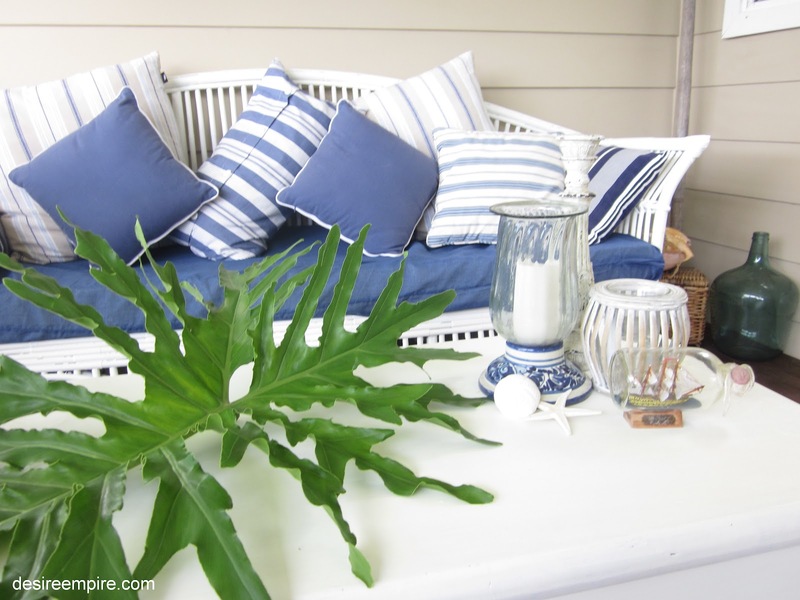 I love your beachy blue and white porch! So fresh and chic! Congratz on your blogging anniversary! I love your blog and I come here all the time; I put you on my Favorites. Love to pull up your site and see the lovely aqua blues and beachy themes/locales. I've never been to Australia but want to go so much. I'm in Calif./U.S.A. I like that you post fairly frequently/regularly; always something new and interesting. You're a good photographer, too. I'm not one bit weary of your nice home or your beautiful Sydney & environs. Keep on posting! Thanks. what a great, great space. i love the blues, but that chalk surf board was super fabulous! happy blog anniversary, too! Happy Blogiversary my dear BHG!!!! I love your little retreat and had to laugh when you said that the BHB would wander around the house until they found you out there, I do the same thing!! Enjoy your space and I love everything that you do. happy anniversary! what would we read each morning!! Really, really pretty. I understand it's not practical and probably won't last long. I lived on the beach in Florida for six years and I know how that sideways rain can be. But for now, enjoy because it's quite beautiful! What a pretty little spot for tea and cake at your beach house. Love your blues. one of my top 5 favorite blogs! Happy Blog-versary! I love your blue and white ...just perfect for the porch. I'd be having tea and one of your marvelous cupcakes there, too! Have a delightful week. Boy, I would love sipping tea out there and having myself some relaxing moments, too. I love the blue and white. Matching the Ikea cusions is going to be a big challenge, good luck, but enjoy your pretty nautical stripes while you have them!!! Love that blue and white. It's so crisp and fresh looking. Happy Blog-versary! 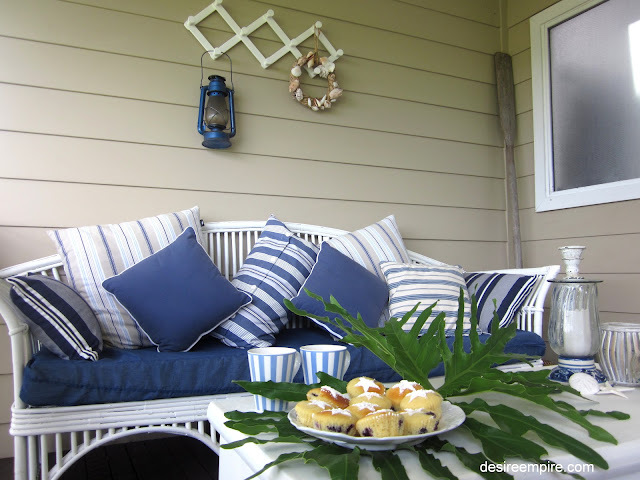 I love your blue and white ...just perfect for the porch. I'd be having a glass of wine with my Hubby on those hot nights. I hope you are having a wonderful weekend with your family. I see I'am one of your followers already. 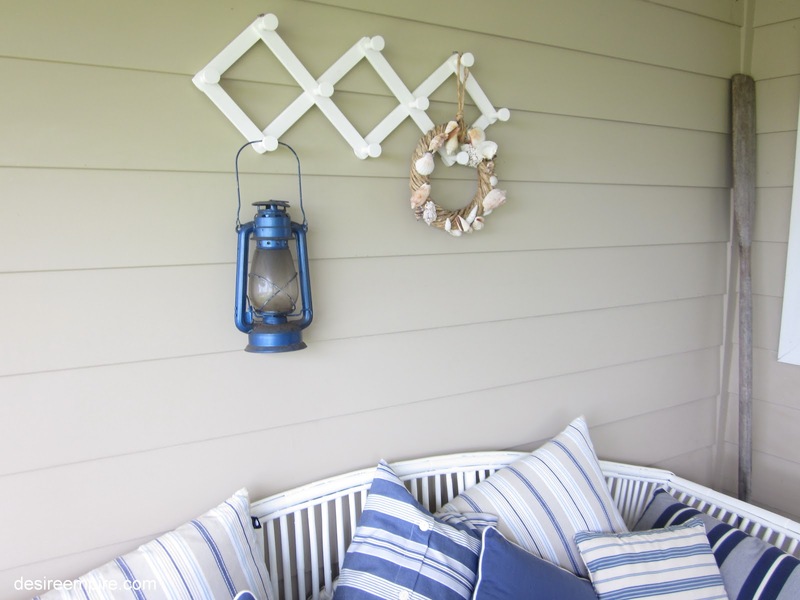 Carolyn, I like the blue and white look for your porch. The Ikea cushions are great too, but I agree they aren't the best with the blue seat cushion. Could you make a slip cover for the cushion? Then you could have two different looks anytime you wanted. So pretty, love the chalkboard serf board sign. 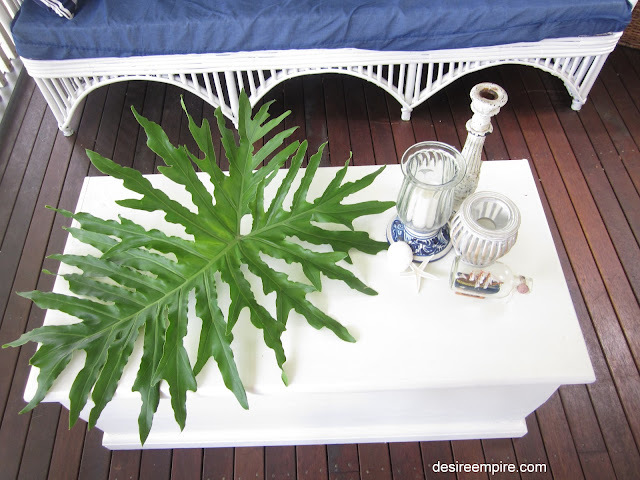 I love the blue and white! Our deck floor is dark blue with white rails. Love the combo. I do love blue and white, so crisp. I live at the beach too, but it is freezing here right now. May is when we set up the deck. I could spend all day out there. I have a blue lantern like yours. 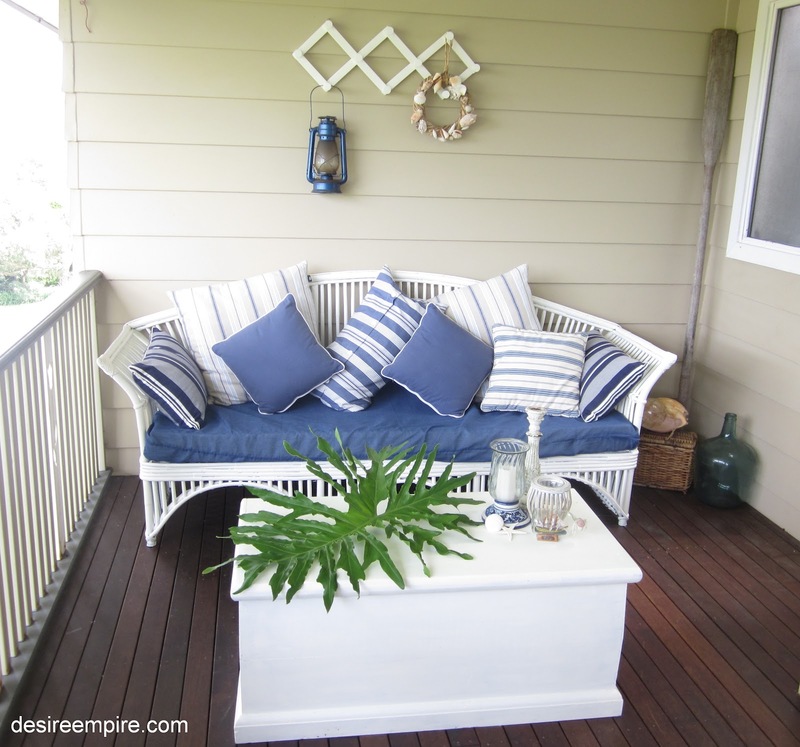 Love your deck, the blues and the stripes are just great. Good job. Carolyn, Your outside area is so fresh and bright! Perfect for the sea! LOVE all the pillows. It makes me want to slap on some sunscreen and go to a place I can dig my toes in the sand! Inspiring. Happy anniversary and I love the blue and white. Nice deck. Happy Anniversary. Your deck looks fabulous, and your cupcakes are making me hungry. Hang in there. We've all had our blogger issues. It looks very inviting! I love the cookie cutter stars on the cupcakes too, great idea! What a cozy little deck! I love it! Oh yes...I love the blue and I'm not even a "blue" person but you're right. I wonder if you could get blue chalkboard paint as I loved the surf board in the corner....hmmmm. It's too bad those aren't waterproof materials..it's so darn cute with the lantern and the lamp on the table. ALso, the cupcakes are adorable an healthy! How cute with the stars...I would have never thought of that but I will now! Thanks again! I love your porch! The blue and white is truly refreshing. And the chalkboard surfboard is such a cute idea! Happy Great Outdoors to you! I am on my way for mojitos right now!!! Beautiful space, lovely nautical colors. Thank you so much for linking up to our party!